Membership allows access at each of the following levels: National, State/Region, Association, Club and Team. A national administrator can access data at all levels within the database. A state administrator can access all data at that state's level and below. An association administrator can access all data at that association‘s level and below. 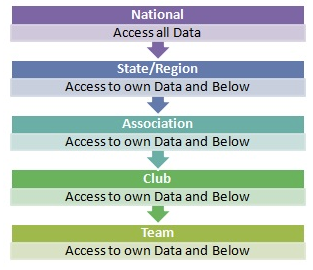 Note: If required, access to association-level data (and club and team data within that association) by levels above (eg. state and national) can be restricted to demographic data only.